The Carlisle Brass Concealed Fix Mushroom Door Knob on Rose Satin Chrome is a compact looking door knob that can be used on any door in traditional or contemporary interiors. It has a sturdy, chunky look coupled with a comfortable feel. It is a robust knob, also making it suitable for commercial settings. 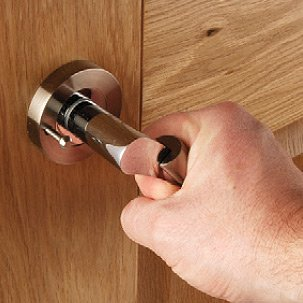 The door knob is made from solid brass and has a satin chrome finish. This finish will require regular cleaning with a soft cloth and non-abrasive wax polish. An appropriate heavy duty latch like the Carlisle Brass Delamain mortice latch will be required for all non-locking internal doors. These are available separately; see Related Products and the Hinges, Locks & Latches category.